Killer storm far from over, US officials warn as 'epic" rain falls - Integration Through Media ....! 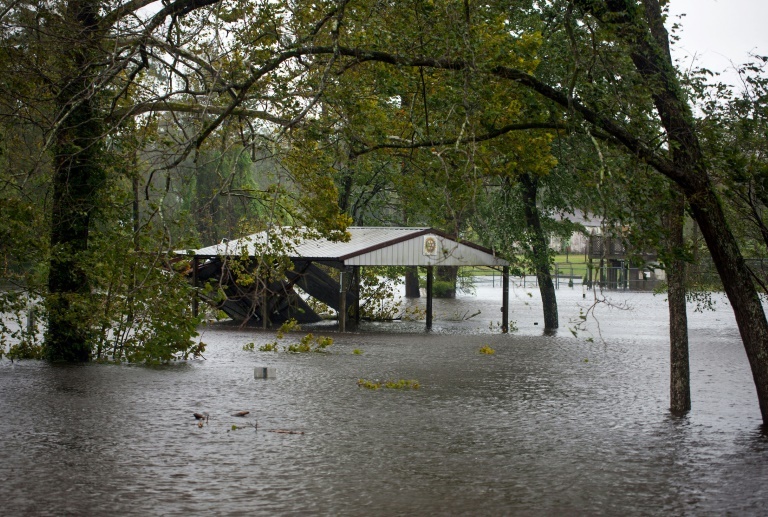 Logan Cyrus, Jacksonville (United States) (AFP) – Authorities on Saturday warned residents displaced by a killer hurricane that its devastation was far from over, as Florence dumped “epic amounts of rainfall” across the southeastern United States, bringing catastrophic flooding. The figure included a woman and her baby killed when a tree fell on their house, while a sixth fatality occurred in South Carolina. On Saturday some residents tried to return home, driving through flooded highways armed with chainsaws to clear fallen pine trees that covered the road. Cooper warned against such behavior as roads become increasingly dangerous. In a separate briefing, Steve Goldstein of the National Oceanic and Atmospheric Administration (NOAA) said some areas have already received two feet of rain and could expect up to 20 inches more as the system moved “slowly, nearly stationary” over eastern North Carolina. In New Bern, a riverfront city near the North Carolina coast that saw storm surges up to 10 feet (three meters), authorities were rescuing stranded residents and taking stock of damages. “Right now we’ve rescued over 400 people. We still have about 100 that want to be rescued and we have about 1,200 in the shelters,” Mayor Dana Outlaw told CNN. “We have 4,200 damaged homes,” he said, urging residents to not wade out into the streets because of the dangers posed by downed power lines. The doors of many homes suffered so much wind damage they appeared to have been kicked in, while the city’s beloved fiber-glass bear statues, which are sponsored by local businesses, were floating down streets. South Carolina Governor Henry McMaster on Saturday announced the death of a 61-year-old woman who died when her car hit a downed tree on a highway. In North Carolina, the mother and her baby were killed in New Hanover County when a tree fell on their house, Cooper said late Friday. Firefighters said the area had not been in the zone under evacuation orders. Local authorities reported a death in Pender County when downed trees prevented emergency units from reaching a woman with a medical condition. Local media said she suffered a heart attack. US media later said a man in Lenoir County died after heavy winds knocked him down as he tried to check on his dogs. The military announced Saturday it was deploying nearly 200 soldiers to assist in storm-related response and recovery efforts, along with 100 trucks and equipment.